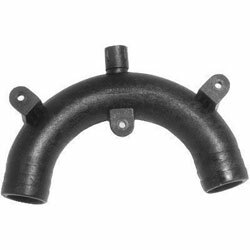 Height: 5-1/4" x Width: 7-3/4"
Vented loops are a vital component in any onboard plumbing system. Without them, the risk of flooding or sinking is greatly increased because water can be back siphoned into your boat from the outside. Back siphoning can occur through any onboard tank, engine, head or bilge system that utilizes a through-hull intake. Vented loops are designed to break-up any back siphon, keeping the boat high and dry. Forespar Marelon Vented Loops / Anti Siphon Valves keep water (or other fluids-but not fuels) from siphoning back into tanks or back into the bilge by allowing air to enter the line and breaking the siphon effect. Whether you are using them on a head discharge system to the holding tank, on a bilge pump outlet overboard, an aqua-lift system on the engine, Gen-Sets, air conditioners, ballast tanks or other equipment, vented loops can stop the dangerous siphoning back of fluids after the pump is turned off. Forespar®, is the worlds largest producer of marine vented loops and offers the widest range of sizes. Marelon® is UV stabilized and will not deteriorate in sunlight.